Gregory: sees lines, shapes, objects in relation to previous perception and proposes that size constancy is significant in understanding the image that the brain processes. Gibson: Gibson's theory is known as an ‘ecological’ theory: with background, horizons, other objects, etc. all playing a part. Unlike Gregory and the Gestalt theorists, Gibson sees real movement as a vital part of perception. Movement has often been overlooked in the psychologist's laboratory and visual perception experimentation. Gibson first developed his theory during WW2 when he was given the task of preparing training films for pilots. From this he developed a theory of optic flow patterns, based on a fixed point towards which the pilot is moving which appears motionless. The rest of the visual environment is moving away from that point, flowing over and around the viewer. The patterns of light reaching the eye can be thought of asn an optic array containing all the visual information available at the retina. This optic array provides unambiguous information about the layout of objects in space. As the optic array flows around you the viewer, the textured gradient of what you perceive gives information about distance, speed, etc. This perception involves almost little or no information processing by the cognitive system. For this to happen Gibson's theory relies on action, or movement. Previous research almost eliminated the movement of subjects in laboratory conditions. Two constants are important: the pole (or the point to which someone is moving) and the horizon in relation to the height of the person. These invariants help to maintain size constancy. 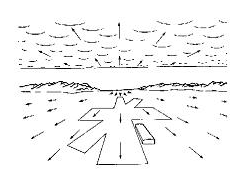 Gibson further explained an ability to filter the optic array as the potential to filter information through resonance. This is rather like radio waves and the radio, which can pick up frequencies that broadcast music etc. distinguishing them from other 'noise'. People are able to 'tune into' their environments fairly automatically. This means attaching particular meaning to visual information. Gibson rejected the theory that long term memory provides meaning. Rather, he argued that the potential use of an object is directly perceivable - a ladder 'affords' climbing up or down, a chair 'affords' sitting. Gibson concluded that visual perception is extremely accurate. Visual Illusions work because the view we have is often of a very short time (impoverished) and usually two dimensional and static, not involving the added perceptual awareness of movement. Visual illusions have little to do with everyday living. However, Gibson only goes so far in understanding 'seeing' and not far enough in explaining how people 'see as' assigning meaning to what we see. This does involve memory and learning. Its worth considering Marr's theory which goes further.